Typical. You wait 15 years for a popular JRPG series to land properly on PC, and then two games come along at once. 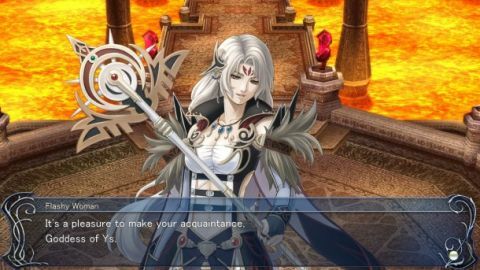 On the plus side, while the last one, The Oath in Felghana, took place midway through the continuity of the Ys series, Origin is a prequel to the entire thing, making for a much better jumping-in point for its arcade-style hack-and-slash action. If you've played the other instalments, you'll obviously get more of the references and understand which blanks are being filled in, but no knowledge of the other games or the backstory is actually required to get through it in one piece. It's a slightly odd game. Where most RPGs are set in whole worlds, all of Origin takes place in a single tower – albeit a huge one, that has entire floors flooded with water and lava in complete defiance of health and safety regulations. There's a real Dungeon Hack feel to slowly working your way through it, though they're not randomised, and there's much more dialogue and story than that suggests. Your goal is to rescue two missing goddesses from the clutches of evil. You can do this either as a cute axes-winging girl or a snobby bishounen mage, although a third character is unlockable later on. All three have the same basic journey, but different reasons for going on it, and plenty of unique encounters. While still prone to presenting you with the occasional vague puzzle or a sudden difficulty spike up the posterior if you miss an item you had no clue even existed, Origin is a much easier introduction to the world of Ys than Felghana. Most of your time is spent surviving relatively easy enemies as you explore the tower, while the main challenges come from respawning monsters and the spacing between checkpoints. Boss fights are where the real challenge kicks in, and all of them are likely to take you at least a few attempts on anything above Easy difficulty. The tower setting may not be as exciting as a whole world, but being able to see exactly how much you have left to go works surprisingly well – and nothing gets the blood pumping quite like one of Ys' weirdly excellent battle tracks. Having to search every last corner for missing goodies is a pain, however, especially when it involves repeat backtracking. The Dash move, for instance, is found in the water levels, but not specifically needed until a deadly corridor in the next area, which in turn can only be survived if you've picked up a magic fruit to buy a harmonica tune from a cuddly critter who only talks in runes. It's not a transparent game, no matter what some fans will tell you if you gripe about it. As with Felghana, Origin's age definitely shows – but the restricted setting feels more self-assured, and it's much easier to slip into the world via its new characters. As long as you don't mind a solid dose of action RPG challenge with your anime charm, and some occasionally irritating exploration mixed in with your hack-and-slash, it's ten hours you won't regret.